There are times in life when giving up something can mean getting more back. We see this when it comes to building a sales team. You have to give up control and let other people and systems execute your new business sales. 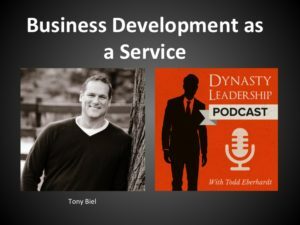 On this episode of the Dynasty Leadership Podcast, Tony Biel of Criterion Business Development joins the show to discuss his business and the benefits of defining your A-list clients. Tony brings 15+ years experience in building and turning around sales teams of various products and services. He’s also worked with 100’s of Entrepreneurs and CEOs to put processes and systems in place to support rapid growth, as well as counteract plateaued results. Tony has heard uncountable variations of the same general definition of “Our Target Market is…” which he’s found, consistently points salespeople in very vague directions. By putting personal business practices in a system, you free up yourself to take on new challenges and opportunities within your own company. If you or someone you know is looking to grow your business or has any questions be sure to contact us. [1:20] How can we find more great and amazing customers to work with? [2:05] Tony helps companies bring in more new business that looks like their top 5% of their best clients. [3:45] What kinds of companies have Tony helped in the past? [5:15] Tony breaks down his 5-step process on how he leads companies through the discovery process and helps them find amazing clients to work with. [9:45] How does Tony help companies discover who their A-list clients are? [16:05] Tony has a scorecard for companies to help prioritize and systematize what’s really important to the company when it comes to finding their best client. [18:30] Change is hard and it can be difficult to help people move in this new direction. [21:40] What are some of the common mistakes people make?